Although he was twice selected to the NHL All-Star Team, was a three-time recipient of the Lady Byng Trophy, played on three Stanley Cup championship squads and finished in the NHL's top ten scorers on ten occasions, Alex Delvecchio cites having his sweater retired by the Red Wings organization as the pinnacle of his NHL career. 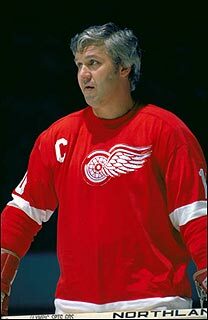 Although often overshadowed by both the productivity and longevity of teammate Gordie Howe's career, Fort William, Ontario-born Alex Delvecchio very quietly yet efficiently played an integral role on the Detroit Red Wings team for twenty-four seasons. After leaving the ice surface, his legacy continued in Detroit as Delvecchio first moved into the coaching role, then later, the position of general manager position with the only team with which he had ever been associated. To commemorate a lifetime of achievements with the Red Wings, on November 10, 1991, Alex Delvecchio had his number 10 retired by the Detroit Red Wings franchise. That same night, Ted Lindsay's number 7 was also retired. Both Delvecchio's number 10 and Lindsay's 7 were hoisted to the rafters of Joe Louis Arena in a fifteen-minute ceremony before a game between the Red Wings and the visiting St. Louis Blues. Hanging in the rafters of Detroit's Joe Louis Arena is the retired #10 of Alex Delvecchio. Next to it is teammate Gordie Howe's retired #9, the only Red Wing number retired prior to Delvecchio's ceremony. 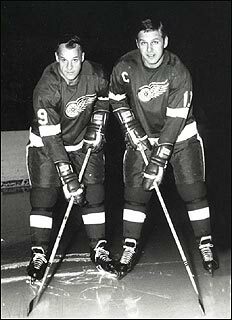 As a member of the Wings' famous Production Line with Gordie Howe and Ted Lindsay, Delvecchio's jersey was hung with those of his linemates to reflect their status as a line. As centre of the unit, Delvecchio's 10 symbolically hangs in the middle, with leftwinger Lindsay's number 7 on the left and rightwinger Gordie Howe's number 9 on the right. Gordie Howe's number was the first Red Wings sweater to be retired by Detroit. Lindsay and Delvecchio's sweaters were numbers two and three. Since then, Terry Sawchuk's number 1, Larry Aurie's number 6 and the number 12, honouring Sid Abel, have also been retired. Jimmy Carson, who had been wearing number 10 for Detroit, changed to number 12 when Alex Delvecchio's sweater number was retired. Alex was elated at the honour. "I've been inducted into the Hall of Fame and I've been on Stanley Cup winners but this is something you always dream of," he stated at the ceremony. "Someday, my children and grandchildren can look at my jersey and know that's their Dad." Kevin Shea is the Manager, Publishing and Editorial Services at the Hockey Hall of Fame.